Q: What is a group of grown cats called? 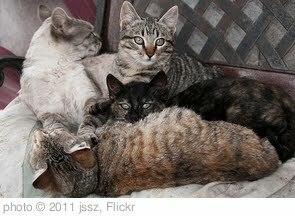 A: A group of grown cats is called a clowder. Remember every Monday a new question is posted giving you another chance to get an entry. of course I was right! I have a kitty brother! Really? I never would have guessed that. Guess I need to brush up on my cat trivia!